RovoControl is free software from AJA for macOS and Windows, designed to be a simple application for controlling one or multiple RovoCams, offering easy control of all the main camera features like zoom, iris and focus. RovoControl uniquely offers ePTZ for moving an HD 1080p box around the UltraHD frame, allowing Pan, Tilt and Zoom for HD output. When RovoCam is in UltraHD Mode, RovoControl's unique ePTZ feature allows the user to select a 1080p HD ROI (Region of Interest) Frame from the UltraHD raster for 1080p 50 or 1080p 59.94 output with full Pan, Tilt and Zoom capabilities. When desired, apply optional image stabilization for smooth image movement output, ideal for use in live environments or even push in further with optional Digital Zoom. A single RovoCam workflow offers a simple path for control and configuration. Connect your RovoCam via a Cat 5e/6 cable to your RovoRx-HDMI for all inclusive transport of Video, Audio, Control and Power. In turn connect the RovoRx-HDMI to your Mac or PC with the RovoCam's included USB to RS-232 cable and launch the free RovoControl software to perform all settings and configuration parameters for the RovoCam. RovoCam multi-cam workflows offer a simple path for control and configuration with RovoControl's ability to control multiple cameras simply within it's elegant interface. Connect your RovoCam via a Cat 5e/6 cable to your RovoRx-HDMI for each camera for all inclusive transport of Video, Audio, Control and Power. In turn connect the RovoRx-SDI or RovoRx-HDMI to a USB hub with each RovoCam's included USB to RS-232 cable. A single USB cable connection to your Mac or PC from the HUB then allows you to launch the free RovoControl software to perform all settings and configuration parameters for each RovoCam. RovoControl v3.0 is fully supported on macOS® and Windows®, with Linux® support coming soon. Control and display RovoCam’s beautiful UltraHD/HD imagery remotely with RovoControl and RovoRX-HDMI. RovoCam itself features an integrated HDBaseT transmitter. Not only does HDBaseT offer affordable long cable runs up to 100 meters over standard Cat 5e/6 cables, it also passes RovoCam’s gorgeous UltraHD/HD imagery, audio, control of the camera, and power to the unit. • 1 x HDBaseT connector (RJ-45) allowing camera interaction and control, uncompressed video, audio and power all over one Cat 5e/6 cable. Control and display RovoCam’s gorgeous UltraHD/HD imagery remotely with RovoRX-SDI and RovoControl. RovoRX-SDI is a companion UltraHD/HD HDBaseT Mini-Converter receiver for RovoCam, with additional support for other higher frame rate HDBaseT workflows, with four integrated 6G/3G-SDI outputs and HDMI video and audio outputs for UltraHD and HD workflows. Receive the RovoCam’s video and audio up to 100m away from the camera, and output to 6G/3G-SDI monitors, routers and recorders and HDMI TVs and devices simultaneously. 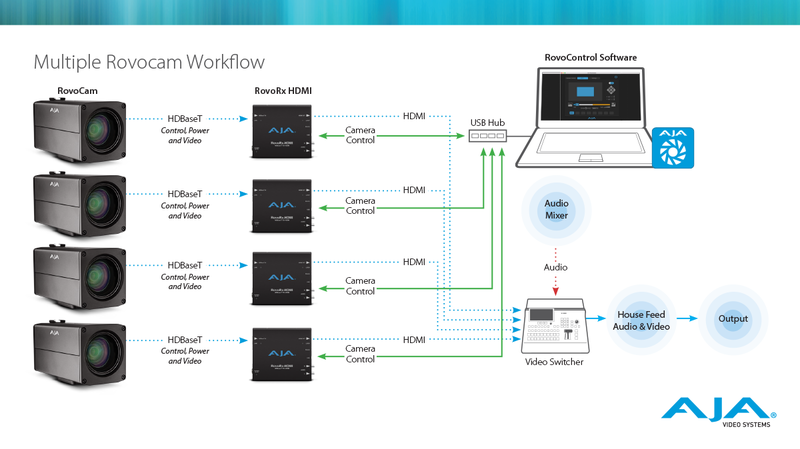 The HDBaseT connector on RovoRx-SDI supports camera uncompressed video, audio, power, and control, all over a single Cat 5e/6 cable, greatly simplifying cabling and systems integration. RovoRx-SDI uniquely offers a DA Mode for signal distribution from an HDBaseT source, greatly expanding HDBaseT delivery options. 1x HDBaseT connector (RJ-45) allowing for camera interaction, power, and control, all over one Cat 5e/6 cable. Control and display RovoCam’s gorgeous UltraHD/HD imagery remotely with RovoRX-HDMI and RovoControl. 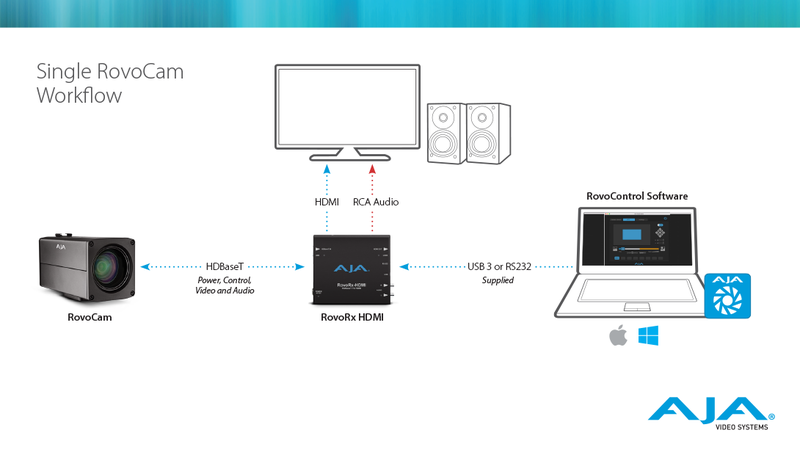 *RovoCam Audio is not carried over to the HDMI output on RovoRx-HDMI, it is only output via the RCA 2 channel connection. 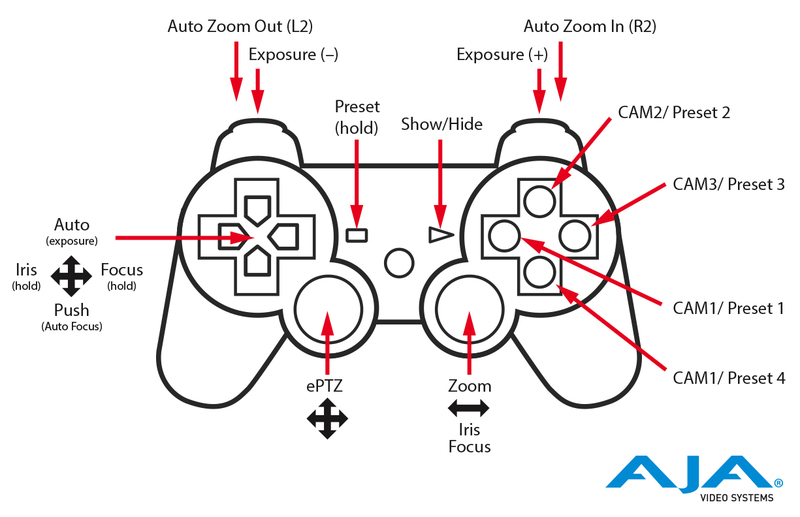 RovoControl v3.0 introduces USB controller support for mapping RovoControl controls to a USB interface for game style controllers or USB joysticks, greatly expanding affordable and efficient options for controlling RovoCam.